I asked my guide, Moses, what his favourite bird was. Surprisingly he said it was the red-billed spur fowl, perhaps not the most exciting bird, but apparently its explosive alarm call is a useful warning sign for lions if there is a flock up a tree or a bird of prey if the birds are scurrying for cover into thick bush. The things that guides have to listen out for! A short while later we came across fifteen lions flopping under a knob thorn acacia tree, but not a spur fowl was in sight. Some of the older lions were looking, in an uninterested way, at a journey of giraffe in the middle distance. The giraffe were keeping an eye out for serious danger, but it was midday and probably too hot for lions to attempt an assault on such a large animal. After half an hour enjoying the scene we wondered whether lunch might be beckoning. Our guide, however, suggested we linger a little while longer: it was a good call, because often in Africa if you wait a bit you are rewarded. A warthog trotted into view. They have poor eye sight unlike the giraffe. The lions were suddenly poised, then stalking before erupting into a full ambush; in moments the hapless beast was pulled down and a feeding frenzy began. 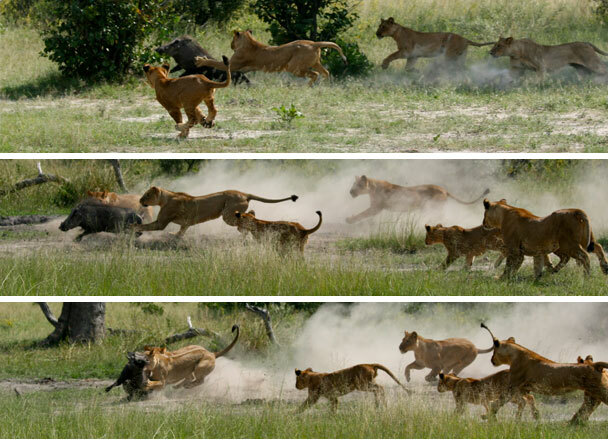 The flopping lions had turned into opportunist killing-machines in a nanosecond. Curiously the giraffe approached closer, intent on keeping a watchful eye on the king of beasts. The action had woken the pride up and we were treated to post-feeding grooming, playing, tree-climbing and greeting when the two big pride males appeared, a little late, to scrap over the remains: two hours of close-up visceral action all to ourselves and on one of my favourite private concessions, Selinda in northern Botswana. The jewel in Botswana’s safari crown is the Okavango Delta. Two million years ago humanoids began to make tools in the Olduvai gorge on the great plains of East Africa whilst at the extreme end of the Great Rift Valley an eco system was evolving from gradual shifts in the earth’s fault lines and the impact of rainwater from the Angolan highlands that filtered incredibly slowly through constantly changing channels in the Kalahari sands. The floodwaters usually reach what is now called the Okavango Delta some time between April and May, kicking the grasses back into abundant growth with resultant wildlife numbers reaching a super-abundance by June onwards. There are many fascinating facets to this delicate watery wilderness, and I particularly like the termite mounds that form an essential part of the delta system. Besides the intricate goings on beneath them (ask your guide when you visit for the full explanation), defunct termite mounds have left rock-hard bases that have compacted together over millennia to form islands in the myriad of waterways. Many safari lodges are built on them, so it’s no exaggeration to say that your comfy safari-bed nestles above a once thriving termite colony. If there is one animal that you will see lots of in Botswana it is the Loxodonta africana. Whilst the terrible “genocide” of the mighty elephant, which has reached a tally of 30,000 a year, continues elsewhere, the Delta remains a refuge for these highly intelligent beasts. Rhinos are now at vast cost being relocated here from South Africa where the poaching is out of control. If there is one activity unique to the Delta it is the mokoro or dugout canoe, which was developed by settlers from Central Africa in the 18th century as a practical solution to moving about the Delta’s rising and falling water-channels and remains so today. The “gondoliers” of the Okavango take the strain as they pole you through the peaceful channels where you can watch the incredible bird life such as the colourful malachite kingfishers or the lilac-breasted roller flashing iridescent blue as it performs aerobatics high above you. The wings remind me of a Spitfire. We saw a honey badger nosing along amongst the reeds, which was incredibly lucky; you may be luckier still and see the elusive sitatunga, a marsh antelope. The Okavango is really one of the best places to immerse yourself in pristine nature. The guiding is consistently brilliant as is the wow factor of safari surprises. Fortunately, the government here are proactive in preservation and have stringent anti-poaching laws. Given the shrinking animal world this is to be highly applauded. To experience the Okavango and other contrasting areas of Botswana please contact Miles for more information: 0207 723 5858.